The beauty of running a private blog is that I can actually cover various topics, without being forced to please anyone with a certain quality of content. As time goes by and rants pass through the fingers, different stories have been told so far and it was on the commuter train this evening at 8 pm when I realized my blog is 2 years old. I started blogging in June 2005 because of a) Mzeecedric, who encouraged me to do so, b) i had an idle website and c) another community website refused to publish a story of mine (much unlike the Kenya Times :-), so I opted to publish my stuff on my own website. And although I sometimes feel the urge to write in my mothertongue, most of my entries have been in English so far. That’s 2 years of this still burning desire inside to share a lot of small and a few huge things with the world out there. Sharing, and also a desire to write about people, describing situations, often, not always, trying to portray a glimpse at another world. A subjective view, my thoughts on a few things of interest. My favourite entries of course are these DoItYourself (DIY) projects like the water filter and/or the hinge issue with Irene’s notebook – both entries I am still getting lots of hits for on a daily basis. Interestingly, the water filter issue – as I sometime later on realized that there’s another NGO in Kenya actually promoting the filter system I built – served as another hint for me to formulate an idea I’ve since then been working on. Have you ever wondered about the work of some NGOs, active in the sector of environmental protection, that just reaches a few selected groups? Capacity building, as they so often call it, still is an interesting subject. Michela Wrong’s “In the footsteps of Mr Kurtz” – a book I’ve bought in July 2001 and had left in the shelve since then, waiting for the perfect reading moment to arrive. 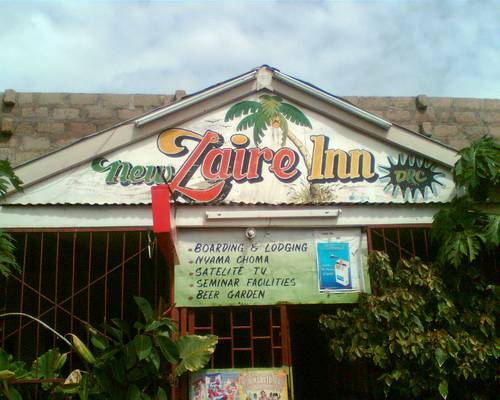 “New Zaire Inn” in Garissa, Kenya, later on renamed to D.R.C…. While Michela has a disputatious way of reporting her stories and apparently isn’t always welcomed by her hosts, I like this particular book. She actually describes the scenery in old Zaire pretty vivid, and what I – of course – love is that special part about les sapeurs – these men who dress in expensive fashion clothes and aim to be different any given moment. As a blogger, I of course associate this with “007 in Africa” and am reminded of those hectic days in 1996/97 when a completely confused former president Mobutu, who had for long already lost any reality for his role as president of a nation that has always been in the waiting line, flew into exile. Ahhh. Memories. That’s 10 years ago! It feels like yesterday. Waiting 6 years before eventually reading Michela’s “brilliant account of Africa’s most extraordinary dictator” (the Economist) wasn’t such a bad idea afer all. The distance provides the needed room which is required to enjoy movies like this one. Michela Wrong’s book – In the footsteps of Mr. Kurtz – is one of the best books I’ve read in the past five years. I was intrigued by her prose, her language, her detailed observations and fluid narrative. I bet you will like it. Congratulations on the second anniversary. Many, many more will follow, I am sure. Hey! I’m flattered you mention me in your post! Ya, Congo…Once it’s under your skin, it never, ever leaves.